This is my last review in my Tea for Tuesday series. I hope you’ve enjoyed my reviews and that they are a help to everyone in selecting a tea that is right for you from Mrs. Angie McCartney’s Organic and Fair Trade Teas. If not, do what I did and order yourself the variety pack and sample them all for yourself! And while you’re on the site, be sure to order yourself a copy of Angie McCartney’s book, My Long and Winding Road. A used copy of her book sells for over $75 on Amazon, but you can get a brand new signed copy directly from Angie from her website. And in case you’re wondering, I get nothing from referrals to Angie’s site. I just think she’s swell, as well as her book and teas! 50 Shades of Earl Grey was a great way to end this series of reviews. This tea is grand! And even though I chose to pair it with a mixed fruit tart, you could enjoy this tea with just about anything. Morning, noon or night, this tea would be a delightful choice. Bold and floral, it’s the tea you dream of when you think of English tea. Great job on this one, Angie…and we can’t help but love the name! What an incredible treat this tea was after last week’s disappointment. Penny Lane Peppermint isn’t just a mint tea…it’s a chocolate mint tea! Yes, chocolate lovers…this tea is for you. It’s a beautiful medium-dark tea with lots of flavor. And when I paired it with a creamy chocolate mousse, it was the perfect end to an otherwise stressful day. I will admit that I sweetened this one up just a bit more when I poured my second cup to get that creamy chocolate flavor to pop. Love this tea, Angie! Good job…considering I’m usually not a fan of mint flavored teas, I’d buy this one in a heartbeat! There are days when I look forward to sitting down in the evening and relaxing with a cup of tea while sitting on my screened in back porch, so I was really looking forward to Golden Slumbers Herbal Green Tea long before I had to sit down and write this review. I chose to go the traditional American route and have this with a slice of apple pie. As soon as I opened the bag to get out a tea bag, I was met with the sweet smell of oranges…my absolute favorite fruit! But it’s kinda interesting that the ingredients make no mention of orange being in this tea. Unfortunately, that’s going to be as good as this review gets. This is the first tea that I can say I was truly disappointed in. Despite my very best efforts to steep and stir the tea bag, this tea would just never get strong enough. I don’t believe it’s just my taste for strong tea that was the problem. There was barely a tint to the water after 7 minutes of steeping in the pot. I think if I didn’t add to lumps of sugar, I would have never finished it. I’m afraid to say, but this one needs to be kicked up a notch, Angie. At least the pie was good…. This review is coming to you from my four day silent retreat at the Abbey of Gethsemani in Trappist, KY. Having been on this same retreat in 2012, I knew the monks were known for their fudge and fruitcake, so that’s what I chose to pair with my tea for this week’s review. And it only seemed obvious that Maharishi Peach should be the tea of choice for a stay at a monastery! As I write this (by hand since electronic devices are not allowed here), it’s 10:30 on Saturday morning. I’ve attended 7:30 a.m. prayer, breakfast and the orientation/welcoming meeting. With a lull in the day’s schedule and seeing they had put out some fudge in the dining room, I took this opportunity to sit down to tea. I can report now that I made a wise choice in my tea selection! The monk’s fruitcake is not like the brick of dried pastry you get during the holidays. Theirs is very moist and is more similar to a spice or carrot cake with dried currants. And now I know that it tastes great with Mrs. McCartney’s Maharishi Peach tea. The spice of the cake is a a great pairing with the peach and fruitiness of the tea. As for the fudge, I let it melt on my tongue and then washed it down with the tea. What an amazing treat that was! I love this blend, Angie! Since this week’s book review was for a book about Wings by John Taylor, who used to play in a Beatles tribute band called The Blue Meanies, it only seemed appropriate that this week’s tea review be for Blueberry Meanie tea! I paired this tea with Biscoff cookies. According to the Mrs. McCartney’s Tea website, Blueberry Meanie is made from: Black tea, Elderberry + Raisin pieces, Hibiscus petals and Natural flavors. The black tea makes this a stronger tea like last week’s Good Morning! tea (just the way I like it), but it doesn’t have the berry flavor you would expect or find in the Liverpool Red tea. I caught a better taste (or should I say aroma) of the blueberries in the after taste and when I exhaled through my nose from the linger tea on my palate after taking a sip. And though this tea contains hibiscus petals, I didn’t get catch any floral flavors. But your mileage may vary. This was a very enjoyable tea and I look forward to having another cup in the future. Good morning from steamy and hot New Orleans! My original plan was to enjoy this tea with a couple of warm beignets at the famous Cafe Du Monde in the French Quarter. Unfortunately, it was much too hot outside to sit at their outdoor cafe with anything hot. Instead, I enjoyed this tea with a simple,yet healthy, granola and yogurt parfait at the lovely restaurant at our hotel. Good Morning! British Breakfast Tea is a beautiful and fuller tea than all the previous ones I’ve reviewed so far. Since I didn’t have my own tea pot, I was forced to make individual cups from the carafe of hot water I was brought, but I was able to enjoy two full cups from one tea bag. My first impression was that this was a very floral blend, but when I offered a taste to my husband, his first impression was the taste of lemon. This tea is named very appropriately as a breakfast tea. It’s a beautiful way to give you just the right kind of pick-me-up to start any day. It’s been a tough week in the Beatles Freak Review office and on the home front. I’ve been busy cleaning out my late parent’s home to get it ready for settlement next week. It’s been emotional and tiring. 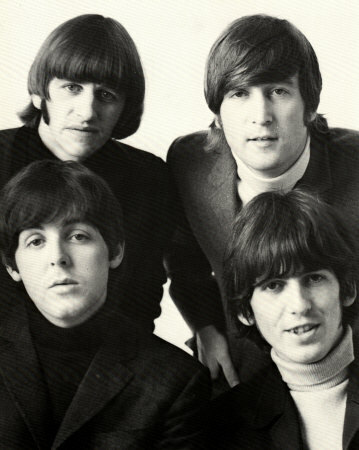 I’ve also been trying to get ready to take Beatles Freak Reviews to New Orleans this coming weekend. Fear not, my loyal readers, I will be posting from the Big Easy! This having been a hard week, I truly looked forward to the decaffeinated tea for one of my afternoon breaks. This tea is made from rooibos, chamomile, linden + passion flower petals, lemon balm + lemon verbena leaves, anise, cinnamon, orange pieces and oat. I really thought it would be the cinnamon and anise that would stand out flavor wise, but it was the citrus-y lemon and orange that came through. It went very well with the pear tart with almonds, but didn’t mesh well with the chocolate. 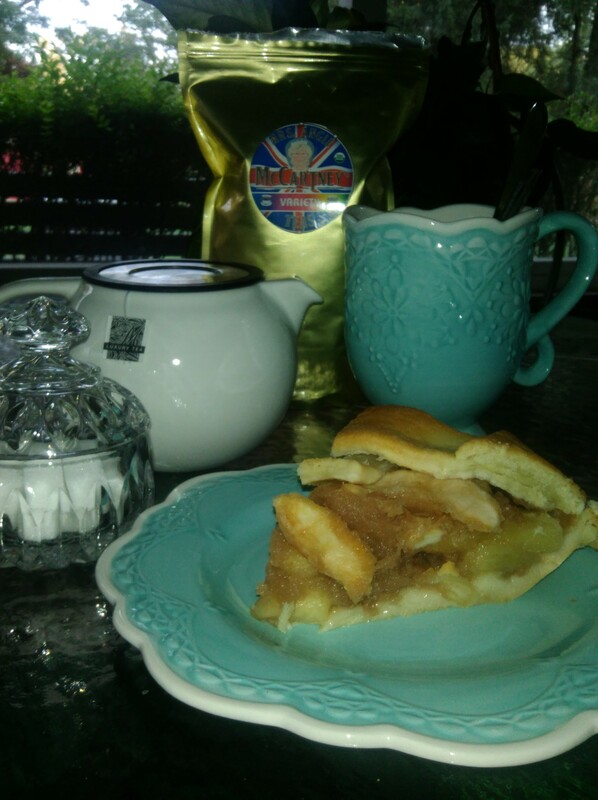 Definitely a tea to enjoy with any type of fruity tart or possibly apple pie. This is definitely a tea that I will be enjoying in the evenings when the colder months move in here. 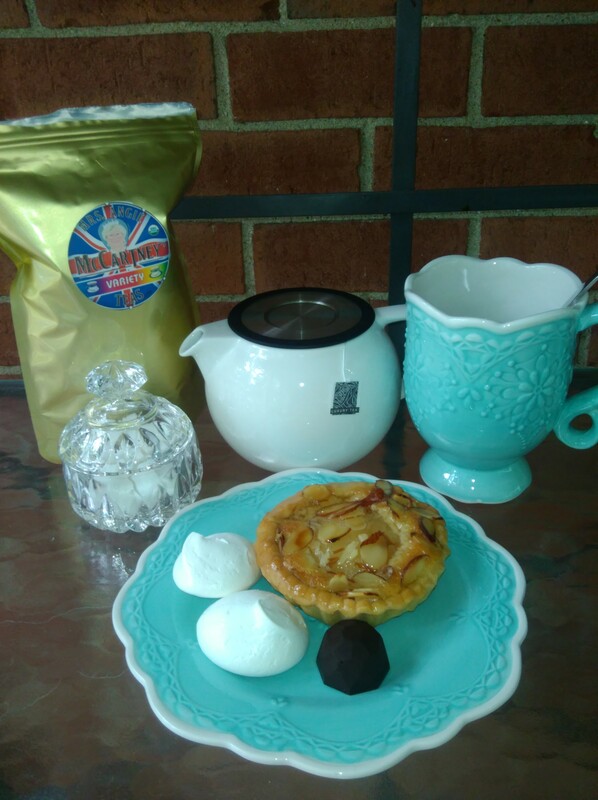 This week’s tea was paired with a pear tart, dark chocolate ganache and Meringue from the Strawberry Bakery in Malvern, PA.